Patience Anna Marshall’s childhood appears to be pretty much non-existent. Evidence indicates her father died before she was six years old. She was married at 13 years-old, had a child, possibly two, and was widowed by 18. She married a second time, while she was still only 18, and was widowed a second time at 41 years of age. Late in life, she lived alone. At 71, she suffered a stroke which left her outdoors, lying in water, overnight, until someone noticed her the following day. After her death, she received no marker—no memorial—to commemorate her life. 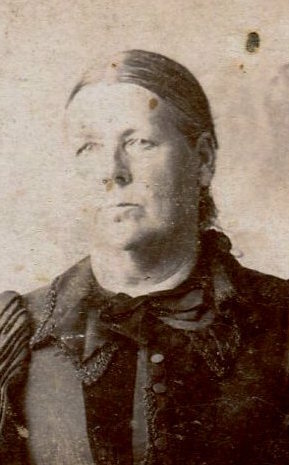 Patience Anna Marshall was born on 30 December 1845. That is the date she indicated as her birthdate when she wanted an increase in her pension payment in 1917. This date is confirmed by the 1900 census which indicates she was born in December 1845. I suspect she had a difficult childhood. She first shows up in the 1850 Census. There, six-year-old, Patience is living with her mother, Jane Marshall, and apparently a younger brother of Jane, Thomas Lawson, and his new wife Susanna. Thomas was 21, but Susanna was only 14; the census indicates that Thomas and Susanna were married in the past year. Jane was 30 and there is no evidence of her husband in that household. One interesting note about the 1850 Census, it indicates that both Patience and her mother were born in Tennessee. In all subsequent records Patience is always shown as having been born in Illinois, however, it is possible that she was born in Tennessee, like her parents. Further research is needed on Jane (Lawson) Marshall to clear up this conflict. On 7 August 1859, Patience married Thomas Dean. According to the 1860 Census, she and Thomas had been married less than a year and Patience was 17 years old. In reality, Patience was only 14 years old at the 1960 Census time. She had been only 13 years old when she married Thomas Dean. On 3 February 1863, Thomas Dean died at the home of Thomas and Susan (Mendenhall) Lawson at Ewing, IL. This appears to be the same Thomas and Susanna that she was living with during the 1850 census and is likely Patience’s uncle. Elnora Dean, the only known child of Patience and Thomas was born on 26 March 1863, seven weeks after Thomas’ death. I did a thorough search looking for Patience and/or Elnora Dean in the 1870 Census records without success. Anyone who found them, I’d love feedback below. Meanwhile, Asa Robert’s first wife, Elizabeth Minerva Toney, died on 26 May 1872 leaving Asa a widower with several children. Three months later, on 25 August 1872, Asa and Patience were married in Jefferson County. Eleven months later, Patience’s first child with Asa, Charles Wilson Roberts, was born. Rosa Della Roberts was born on 26 May 1875. Florence Elizabeth Roberts was born on 21 Jan 1880. The 1880 Census shows none of the children of Asa’s first wife’s family still living with him. Only he, Patience, their children together (Charles, Della, and Florence) and Patience’s daughter from her previous marriage (Elnora Dean) are living in Elk Prairie, Jefferson County, Illinois as a household. On 2 July 1884, great-grandfather Hugh Ellis Roberts was born. Patience would have been 41 years old. Asa Roberts died on 5 October 1886 and Patience immediately applied for a widow’s pension and was granted it. I have several documents from her widow’s pension application that need to be transcribed, (They are difficult to read and may need to be electronically enhanced.) which may shed further light onto Asa and Patience’s lives. The 1900 Census finds (Patience) Anna Roberts living with her two youngest children, Florence and Hugh and a granddaughter. Although Florence is listed in the census as single, the granddaughter is Florence’s child, Nellie. In 1908, Patience’s youngest child, my great-grandfather, Hugh Ellis Roberts died from consumption at the age of 24. The 1910 Census show the widow Patience A Roberts loving alone. She owned her own farm near Barren, Franklin County, Illinois. “Aunt” Patience Roberts, aged 73 [sic s/b 71] of Ina, who is visiting with the family of James Derrington, [her daughter Rosa Della Roberts Derrington’s home] suffered a stroke of paralysis last Friday evening and the stroke came upon her as she was on her way to the home of a neighbor, about dusk. She fell heavily to the ground and where she fell there was a sort of a branch and in it considerable water, but fortunately the old lady did not fall on her face and so escaped being drowned. She was not a great distance from the place where she had started and saw the folks when they went to the barn that evening to milk but could not make an outcry sufficient to attract their attention and she was compelled to lie in the water all night. The next morning her plight was slightly improved but she could not make herself heard and children playing near the place saw something unusual moving in the depression and it frightened them. They rushed to the house and told their parents what they had discovered and within a very short time kind hands had removed the old lady to more comfortable quarters. Her condition at this time shows much improvement. In any event, having a stroke and lying in a water puddle all night is a sad event. It is events like this that remind us of the importance of watching out for our senior citizens. The story also makes me wonder why her daughter, Rosa, didn’t notice that her mother was missing. Patience died on 26 July 1919 in Sesser, Franklin County, Illinois. She was buried on 30 July 1919 at the New Hope Cemetery near Ina, Spring Garden Township, Jefferson County, Illinois. She has no marker. Process/translate Patience Anna Roberts widow pension application and incorporate new information. Search further for Patience and/or her daughter in the 1870 Census. Extend research to second level sources. When I win the lottery, have a marker made and placed to memorialize the life of Patience Anna Marshall, Dean, Roberts. I would like to thank second cousin Chris H. Bailey for sharing his photos, sources, and research regarding Patience Anna Marshall Dean Roberts. Without his sharing, this article would have been much less complete. Family Search; 1850 Census; Thomas Lawson – District No. Ten, Jefferson County, Illinois; https://familysearch.org/ark:/61903/1:1:M85B-65K. Chris H. Bailey; Descendants of John Calvin Roberts & Elizabeth (Blackwell) Roberts; Person #10 – Asa Ellis Roberts. Family Search; 1860 Census; Thomas Dean – Township 3S, Range 4E, Jefferson County, Illinois; Page 138, Line 22; https://familysearch.org/ark:/61903/1:1:MX45-6X1. Family Search; Pedigree Resource File; MMQF-H59 – Hugh Ellis Roberts; https://familysearch.org/ark:/61903/2:2:STXD-FMJ. Family Search; Illinois, County Marriages, 1810-1934; Asa Roberts – P. Anna Dean (Patience Marshall); https://familysearch.org/ark:/61903/1:1:KFKM-2TR. Family Search; 1880 Census – Asa Roberts – Winfield, Elk Prairie township, Jefferson Co., Illinois, Sheet 481B, Line 8; https://familysearch.org/ark:/61903/1:1:MXJB-QBD. Family Search; 1900 Census; Anna Roberts, Barren Township, Franklin, Illinois, United States; citing sheet 10A, family 182; https://familysearch.org/ark:/61903/1:1:MSWM-6TC. Chris H. Baley; The Samuel Vaden Scott Family – Clora Dell Scott. Ancestry.Com; 1910 Census; Patience A Roberts – Barren, Franklin county, Illinois. ED 25, Sheet #13A, Line 44. Find a Grave; Patience Roberts – Memorial# 140789109; http://www.findagrave.com/cgi-bin/fg.cgi?page=gr&GRid=140789109. Asa and Patience were buried in New Hope Cemetery (now just called Hope Cemetery) near Ina, Spring Garden Township, Jefferson County, IL. She has no tombstone according to Chris H. Bailey who visited the site in November 1968. Note: on Patience’s Pension application the F.P. Scott signature over the seal is almost certainly none other than ‘Francis Perry Scott’ Patience’s Son-in-Law.